There is a high-regarded quality of extra-virgin olive oil, which is cold-extracted from organically farmed Nocellara del Belice olives, hand-picked in the area of Cosenza, Calabria. This oil is rich in fruity notes of ripe tomato, has fragrant hints of mint and sage and a flavor strong and vegetal. Bitterness is powerful and the spiciness is intense. With regard to color this oil is deep golden yellow with shades of green. This oil is perfect simply drizzled over toasted bread, grilled fish, hearty soups, pasta and seasoned cheeses. Further, this Calabrian olive oil is ideal on fish and in fish sauces, but also substantial enough to match nicely with meat and vegetables. “Nocellara del Belice” is an olive cultivar well present in Calabria, a key-product of Mediterranean tradition of Calabrian Oil. It has, anyway, its origins in the Valley of Belice, an area of south-western Sicily. Further, Nocellara del Belice olives, which grows primarily in Sicily, is also planted in India, Pakistan and South Africa. This special cultivar is a dual-purpose olive, grown both for oil and for the human consumption. Nocellara del Belice DOP table olives. Both have protected status in the European Union. With regard to oli production, this special Nocellara is used to make “Valle del Belìce” extra-virgin olive oil, which is pressed from a minimum of 70% Nocellara del Belice olives. As a table olive it may be treated by various methods, one of which is named for the comune of Castelvetrano in the Valle del Belice. 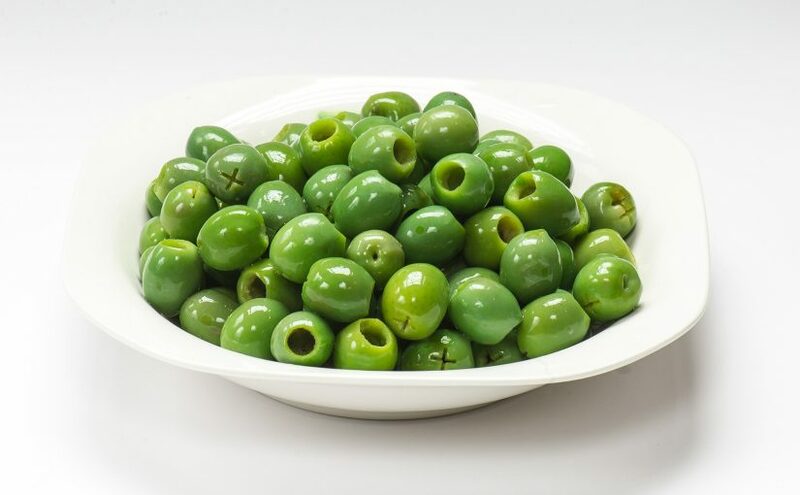 These well known olives are marketed as Castelvetrano olives in the United States and elsewhere, and can be recognized as large, green olives with a mild, buttery flavor. 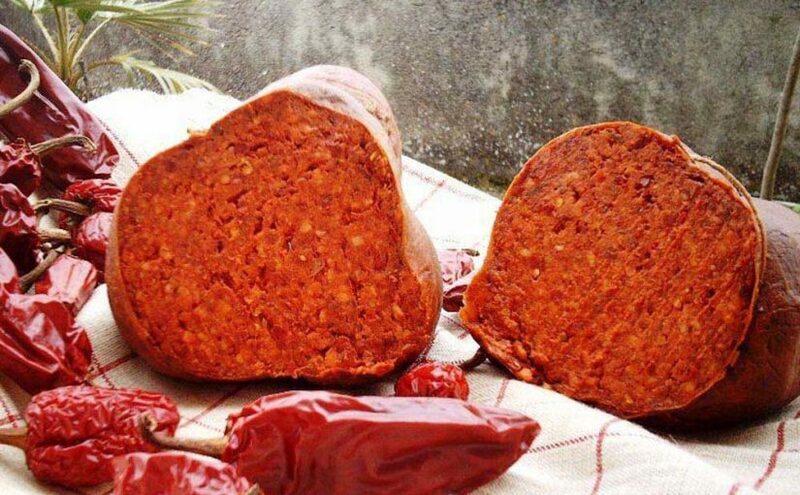 This spicy sausage is one the more known cream of salami in Italy. Inside the Mediterrean basin it has great similarity only with French Andouille (a coarse-grained sausage made with pork, intestines or chitterlings, pepper, wine, onions and seasonings, of generally about 25 mm in diameter). In Calabria, instead, it is one of main types of salami, and got a round shape of various sizes. External color brown; color red interior. Chopping, dough with ingredients, bagging, seasoning. Carbohydrates: 2.90%, of which Sugars 2.50%. Energy value: 407 Kcal or 1,635 Kjoule.